He dons a corporate hat. But Jamshyd N Godrej?s social consciousness gives his business acumen a tough competition. Chairman & Managing Director of Godrej & Boyce Mfg. Co. Ltd, Godrej is striving his best towards making cities sustainable through World Resource Institute India of which he is the Chairman. He travels by public transport often to understand the way it works. So the next time you watch him travelling by bus or metrorail, do not bat your eyelid. He would then go on to use the experience to push for policies that would benefit you. Vidyottama Sharma interviewed him. What exactly does World Resource Institute (WRI) do and how does it work? It is 30 years old. The whole idea was to build policies that really work for people and the environment. We realised quiet early that transport was one of the largest causes of environment degradation. The main intention was to lay more emphasis on public transport in such a way that it becomes more mainstream than private transport. The realisation now is that the developing countries are going to build the new public transport for the future because they have realised the limitations of private transport. A good example is of China whose roads are completely choked despite more and more roads being built. There is no other way to solve the problem than to have public transport. The health related issue too is very critical because air pollution is adversely affecting people all over the world. WRI?s mission is to bring in smart interventions that can bring in public, private and government entities on one platform to reduce the harmful effects of transport, and to improve transportation in such a way that it benefits all. In India, perception about public transport is entirely different than in European countries. Giving good public transport which will attract people to use it, is not a dream job. How are you going to do that? The realisation of public transport?s benefits has been there for a very-very long time. Mumbai would grind to a halt if the railways don?t work. A large number of people use the railways and then comes the bus system. The point about public transport is absolutely correct ? it has to be made convenient, it has to be safe, it has to be provided at a reasonable price and it has to be one which every citizen would want to use given an option. There are two aspects here: how do you reduce the overcrowding, and how do you reduce the commuting? One of the biggest problems of Mumbai?s planning was that the residential areas were in the suburbs and the working areas were in the south of the city which forced all this commuting. Now, had Mumbai been thought of right from the beginning as a series of multiuse centres, the situation would have been different. Had there been 20-30 such centres which had office spaces, residential spaces, entertainment options and shopping arcades ? everything together, the number of people working within these clusters would have been large, leaving a very small number of people to travel between clusters. The government is one of the biggest culprits in this because all their offices are in south Bombay, almost all the government employees travel quite a significant distance every day. New Bombay?s idea was to do away with these problems ? to decongest the city. For New Bombay and Thane, etc., they were going to build an entirely separate government system there, but it has still not decongested South Mumbai. 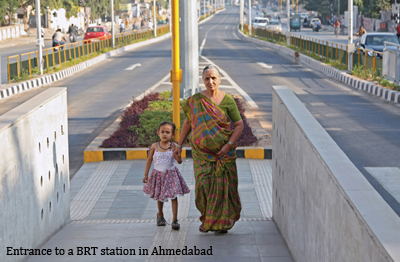 That is why we are encouraging Transit Oriented Development (TOD). I think proper zoning and planning is very important for multiuse centres. The clusters have to be defined in the right manner. There are many ways to do so: for example, a kilometre around the railway station or a kilometre around the bus station. You have to have something which is close to a transport point from where you can easily get in and out by walking or by some other easy mode of transport. Such planning reduces the movement enormously. The second thing is to so plan the transport system that it moves from node to node in way that enables people to move around. 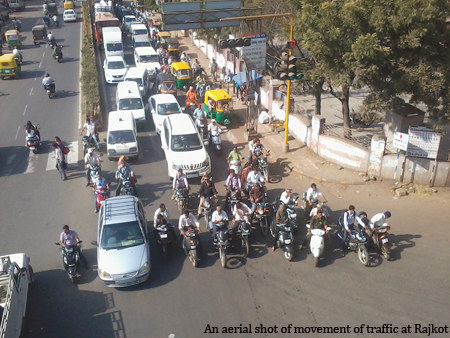 It doesn?t really matter whether it is railways or BRTS or the metro or the most appropriate form of transport. The difference between Japan and the rest of the world is that in Japan, they plan extensively. They realise that without proper planning, their implementation will not be smooth. Most of the rest of the world gets very impatient, they don?t spend enough time on planning and thinking through. That?s why implementation flops. Does that mean fewer roads will have to be built? It?s not that we should not build any more roads and flyovers but it is important to plan ways to incorporate public transit in that. During the building of the roads, nobody asks BEST what design of the road or the flyover would benefit it the most, most of the time the attention is given to benefitting the cars. Delhi CM Sheila Dixit was right when she said that despite the hue and cry by car owners on Delhi BRTS being introduced, the people travelling by those buses were happy as their travel time was drastically reduced. What had failed them was a poor design, not the bus system. Now they are looking at it from a citywide transit point. Even when Delhi Metro was planned, it should have been planned with multimodal intersections. But Delhi has a culture of personal cars, often with each adult of a family owning, or aspiring to own, one. It is a glaring necessity. If you look around the world, wherever cars have grown, they have grown essentially because of lack of public transport. Whether it is London, New York, Geneva or Zurich, you name any big city of the world, the first intention of the people is not to buy a car. It is to use the public transport. For going out of the city, they hire a car. They know that the public transport system is good enough for them, so there is no question of buying a car. As against this, in America if you go to places like Houston or Dallas where you have huge towns without public transport, you cannot live without a car. It was a challenging task in Florida to force people to move to Sun Rail as they were too used to their private cars. Our public transport works at present because majority of the people cannot afford modern cars. When they can, encouraging public transport will be a daunting task. There are so many other aspects too that need to be considered, like parking. At some stage, you will have to realise that there is just no way that you can come into town unless you have proper parking. There are so many ways to control such commute ? the cost of parking can become astronomical. In places like London and Singapore, for access to a city you have to pay according to the time, the day, etc., and it is absolutely automatic. If you pass a barrier in Singapore, you are automatically debited, you don?t even have a choice. A little beep comes in your car that you have been charged. And people pay, it is not that they don?t pay.